Home Clothing Culture Mod Modernism Review Style UK 'The Youth Club' by Neil Trelford. 'The Youth Club' by Neil Trelford. Anyway back to the book. 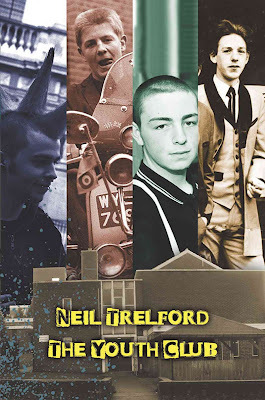 Neil describes how him and his gang of merry men become immersed in the Mod revival of the late 1970's early 1980's and into the sea of green parkas. When I turned mod in 2008 I took great inspiration from the revival era and still do to this day. Neil speaks of how closely music and politics were and how they shaped your days and nights. Its amazing to see the parallels between then and now! Neil describes the trouble between the different youth cults and how if you're not one of them it would usually mean trouble. On one occasion in the youth club disco, the gang of fired up mods charged at and attacked a small group of punks who luckily manage to escape pretty much unscathed. All these tales and more give the book that superb first hand account of British youth culture that so many books of its kind struggle to produce. Neil describes perfectly the passion these kids have for clothes, music and football and how their whole worlds revolve around it despite the serious political warfare going on all around them. It gives you that innocence that you felt as a young lad/lass back in the days when you had no responsibility or work. Oh how I long for that back! I really relate to the centre of the lads operations 'The Youth Club' an area where most of their activities revolve. They love the youth club and it's their main source of joy in life. When the lights go down and their favourite tunes play they are all one, and their little brotherhood is something which so many lads involved in sub-cultures have felt across the world! You can't beat it. That summer in Neil's life was certainly an eventful one. I urge you all to go out and find out about it for yourselves. 'The Youth Club' takes you on a journey of youthful discovery in the height of the mod revival and it's just what life's all about!